I've just arrived in London, on a very flying visit which will take in a short trip up north to see my family, plus some work-related stuff later on in the week. It's cold. In fact, it's snowing, which it actually doesn't do all that often in London, contrary to the perceptions of most Indians. Indeed, one of the most common responses to learning I'm English is to say "ah, very cold country! ", as though England were located some way north of the Arctic Circle. The fact is England isn't that cold, it's just hardly ever particularly warm. It's wonderfully moderate, which is why the Delhi summer was such a struggle for me. But when I tell people that by far the coldest winters I have experienced were in Korea (where temperatures of -15 are usual, and -20 not unknown) they're generally astonished. Anyway, I can't help but find it rather amusing when my Delhi friends post endless facebook status updates along the lines of "OMG I've never been this cold before EVER!" when it's about 6 degrees out. I admit that Delhi gets a bit chilly. But really guys, it's not that bad. The real problem is that Delhi homes just aren't built for the cold. My flat has no heating and marble floors. Never in my life have I used slippers but I invested in some when I went home for Christmas and I've been immensely glad of it. For the last month or so I've actually had to go outside to warm up a bit (the sun generally keeps shining, so even when the temperatures are low there's warmth to be found). And it's a dry cold, not like the all-pervasive damp of an English winter (the depths of which I'm now experiencing). My favourite thing about Indian winters is the quite remarkable clothing it brings out in the Delhi citizens, especially the men. Best of all is the array of ear muffs (my colleague Rajat sports a particularly admirable pair), which become ubiquitous as soon as the temperature drops below ten degrees or so. Plain ear muffs just won't do: tartan, leopard print or combat-style are all the rage. 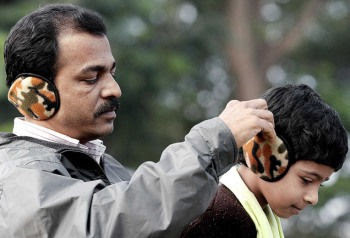 They take their ear muffs seriously, Delhiwallas. The guys I really admire, though, are the rickshaw drivers. I may scoff at Delhi's temperatures, but riding in rickshaws in this weather really is bone-chilling, generating a true "lazy wind" (you know, the kind that can't be bothered going around you, so it just goes right through you). I can't imagine how these guys feel at the end of their shift - or how much they look forward to the warmer weather. Ah well, no doubt by the time I get back to Delhi the mercury will be climbing once again towards the highs of May (45 degrees plus). I'd best enjoy my shivers while I can. Sonya, did you just ask me what I am wearing right now?? This is not the kind of talk to which I am accustomed from you. Shameful.